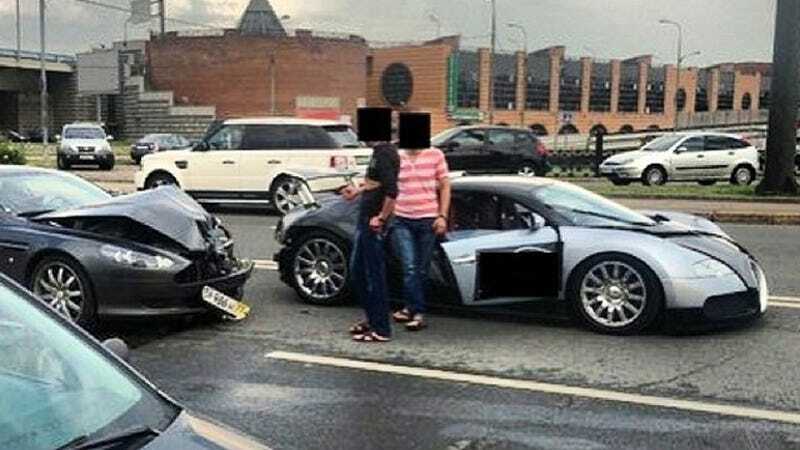 An Aston Martin DB9 rear-ended a Bugatti Veyron in Moscow over the weekend, but there's no dashcam video of the crash. Come on Russia, we expect better from you! I thought that if there was any one thing I could trust Russia for, it was that every single hilarious or bizarre road incident would be recorded on someone's dashcam. I mean, if a single tree falls in a Russian forest, a dashcam will record it. If a meteor falls over Russia, a dashcam will record it. If a Bugatti gets into a crash in Russia's biggest city, surely a dashcam will record it, right? The crash was at least photographed by Instagram user dmitrydee and picked up by CarScoops. The blurred faces and door logo on the Veyron make me thing something fishy is going on in the shot. I'm patiently waiting for some yahoo to upload video of this incident to LiveLeak or whatever. I just know that the video – the truth – is out there.